The Bible tells us that for everything under the sun, there is a time, but lately I feel like there’s no time for anything. Days, weeks, and months just roll into each other. Can you believe there are only 52 days left until Christmas? Time… Fleeting. Fading. Finite, and at the same time, infinite. Well, I was gobsmacked when I saw I was up to blog again. Really? Admins, are you sure that calendar is correct? Wasn’t it just last week that I’d blogged? Alright, I believe you that a month has passed and it’s my turn. Time gets away from everybody these days it seems. Sometimes we can do nothing to change our plans to keep up with time…like blogging again so soon. Fortunately, sometimes we can. One of the plans I was grateful to adjust was the release date of our upcoming box set which was originally scheduled to publish on October 31. Over the past few weeks, several of our authors have struggled with various issues ranging from their own health, to their mothers’ health, to plain old stubborn writers block. I myself landed in hospital three weeks ago to repair a torn meniscus in my knee. A fellow author said it sounded romantic and wondered if I would write that into one of my books. I told her the only thing romantic about the process was my doctor’s bright blue eyes. Oh, and my wonderful hubby cooking and cleaning as I hobbled about on crutches and did physio for well over an hour every day. But, I digress. The authors of the Snuggles & Snowflakes box set are finally finding our groove again, and for most, life is returning to normal. While we haven’t finalized the release date, which we’re hoping will be in about three weeks, I can safely say that before November ends, we will be bringing readers another six (we hope and pray) Christmas novellas that will warm their hearts. And once again, there will be mouth-watering, palate-tempting recipes at the end of each story. We’ve just completed Forty Days of Love at our church and in our small groups, so this is a good time to introduce you to my offering in this set. A Time to Love is Book 2 of my Seasons of Change series in the Under the Sun collection. If any of the characters sound familiar, that’s because they are…many of them first made an appearance in Book 1, A Time to Laugh. 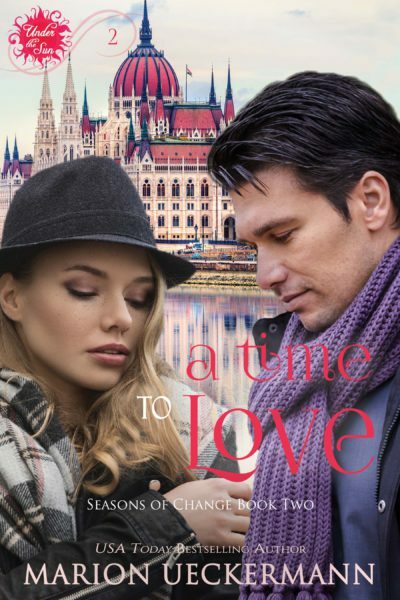 As a treat for Inspy Romance readers, I’m giving you a first peek at A Time to Love’s cover (which I’ve just redesigned to include the handsome hero, Jordan), plus the blurb and first scene to read. I hope once the set releases you’ll take the time to enjoy some armchair travel to the small coastal town of Ballito Bay in South Africa, and then across the continent of Africa to the beautiful European city of Budapest, Hungry. Furthermore, as soon as Snowflakes & Snuggles releases, I’ll gift a copy of the set to one lucky reader who leaves a comment on this blog. Everyday life for Dr. Melanie Kerr had consisted of happy deliveries and bundles of joy…until her worst nightmare became reality. The first deaths in her OR during an emergency C-section. Both mother and child, one month before Christmas. About to perform her first Caesarean since the tragedy, Melanie loses her nerve and flees the OR. She packs her bags and catches a flight to Budapest. Perhaps time spent in the city her lost patient hailed from, can help her find the healing and peace she desperately needs to be a good doctor again. Since the filming of Jordan’s Journeys‘ hit TV serial “Life Begins at Sixty” ended earlier in the year, journalist and TV host Jordan Stanson has gone from one assignment to the next. But before he can take a break, he has a final episode to film—Zac’s First Christmas. Not only is he looking forward to relaxing at his parents’ seaside home, he can’t wait to see his godchild, Zac, the baby born to the aging Dunhams. His boss, however, has squeezed in another documentary for him to complete before Christmas—uncovering the tragedy surrounding the doctor the country came to love on his show, the beautiful Dr. Kerr. In order to chronicle her journey through grief and failure, Jordan has no choice but to get close to this woman. Something he has both tried and failed at in the past. He hopes through this assignment, he’ll be able to help her realize the tragedy wasn’t her fault. But even in a city so far away from home, work once again becomes the major catalyst to hinder romance between Jordan and Melanie. That, and a thing called honesty. “Dr. Kerr? Is everything all right?” Clean gauze swept across Melanie’s brow. If only the nurse could mop up her anxiety as easily as she did her sweat. “I—” Melanie took a step back. I can’t do this. I thought I could. I thought I was ready. But I’m not. And I have no idea when I’ll ever be ready. She shifted her gaze to her colleague. Thank heavens she’d asked him to assist. “Dr. Humphries, I need you to take over.” She handed the scalpel to him and turned away, her first steps toward the door slow, unsteady. And then she didn’t care as she dashed the rest of the way, “I’m sorry” trailing her until she burst out of the operating room. She yanked the surgical cap from her head. The mask covering her mouth followed next, and then the gown wrapped around her body. She dumped the protective clothing into the laundry bin. Grabbing the latex gloves at her wrists, she tugged them from her hands then threw them into the biohazard bin before rushing out into the wide corridor outside the OR. She had to get away. And not just from the hospital. She had to escape her life and the nightmare. She had to find healing and peace before she set foot inside a delivery room again. If you’d like to receive information on new releases, cover reveals, and writing news, please sign up for my newsletter. My novella, Spring’s Promise, will be sent free to new subscribers. I hope your knee is healing, it sounds nasty and painful! I enjoy ‘travelling’ through books, so look forward to new places. A friend from work has just returned from visiting her family in Durban- South Africa sounds like a beautiful country. Time does fly, I suddenly realised this blog posted … two days ago! Eep, sorry for the late response. Got that deadline for A Time to Love looming, so it’s been head down and work, work, work. Fortunately, no pain with the knee op, but I can certainly see why they say 4 months total healing time…won’t be running anywhere too soon. South Africa has so many beautiful places, and Ballito Bay, where part of A Time to Love is set, and just north of Durban, is one of them. Time does fly. I was Mom to 8. So hard to believe they are grown and raising their own babies. I now help them when I can. 18 grandchildren I have been blessed with. 9 attend the same church I do so I get a lit it Grammy time. Wow, you are a blessed woman, Lisaan. And with so many grandkids, I can totally understand why time flies for you. I only have two, and they’re a handful, but time spent on them is so worthwhile. Hi Marion and thanks for your timely blog and update on your books. I enjoy reading your Seasons of Change books and looking forward to A Time to Love. Having my last son at 40, I identify with your characters. Looking forward to the boxed set. 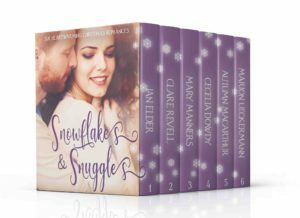 Titles with alliteration always catch my eye – Snowflakes and Snuggles. How fun! Definitely hard to believe another year is coming to a close. Where does the time go – the days, weeks, months and years. On Halloween my mom would have been 97 and it was difficult to fathom that she passed 10 years ago. This year I have been retired 5 years. My oldest grandson celebrated his 12 birthday and my oldest son will be 40 in March. Best wishes and Happy Writing! Thanks, Renate. Hopefully there’ll be lots of snuggles, and some snowflakes, too, for everyone to enjoy in our new box set. I really like the cover of A Time to Love. The boxset sounds like a winner. I also agree that time keeps moving faster and faster. The Christmas season is just around the corner. It will be here before we know it, ready or not. You are welcome, Colleen. And thanks for the encouragement about my books. The surgery and recovery on my knee has been a breeze (totally different to my expectations), but I do have to be careful with how I walk in terms of turning/running. I’ll wait out the 4 months total recovery until I try those tricks LOL. Thanks so much for sharing! I love stories involving Christmas! I will have to keep watch for these! Thanks, Jenny. I’ve read two of the stories in the set (excluding mine LOL), and they are wonderful. I agree, as I seem to never have enough time to get everything done. I can identify with the torn meniscus, as I had that surgery several years ago. I enjoyed reading this. Have a blessed day. I loved the excerpt and the beautiful covers on your books. You are a new author to me and I want to check out your books! Thank you. I hope you get to read some of my stories soon. My Seven Suitors for Seven Sisters series is a good place to start. Books 1-4 are available in eBook, and book 5 is in the Picnics & Promises box set. EEEKKK! I CAN’T WAIT for A Time to Love to be released!! I laughed out loud while reading A Time to Laugh. Each of your books are TREASURES!! Praying your knee is healing well. And where has October gone?! LOL, you crack me up, Becky :) Soon … A Time to Love is almost ready. So glad you love my books – what an encouragement. Knee all good, and yes, where has October gone? I was supposed to be done and dusted with this box set and have it published already. Oh well, it’ll be here soon. Haha, Gail, I first read that as a roller coaster. Oh yes, the roll does unravel faster, the closer it gets to the end. I think so many of us can empathize with this example. Hi, Marion. You are a new author to me, and I am definitely adding your books to my wish list. I love the cover, and the story sounds delightful. I trust you are having a good recovery from your surgery and will soon be going strong again. I agree that time does fly much too quickly. God has blessed me with 80 years, my children are grown with families of their own, and now the grandkids are getting married and starting their families. Where have the years gone?!! 😂😂 Blessings! Thank you. I hope you get to read some of my books soon. Choose a place you want to go and pick a book. So far I can take you to Lapland, Finland, Norway, Scotland, England, Ireland, Northern Ireland, South Africa, Zambia…and soon to Hungary with A Time to Love. Lord bless your writing and recovery. I like the title of the box set. It sounds like a fun read. Thanks, Diana. I hope you get to read the stories in Snowflakes & Snuggles soon! I’m looking forward to A Time to Love! And I agree that October flashed by so fast, I never got any pumpkins to set out on my porch for Halloween. I guess it didn’t matter, as we didn’t have any trick-or-treaters for the 3rd year in a row – we have a long, dark driveway that deters them. So my husband and I volunteered with our Community Emergency Response Team to help with crowd control in a nearby town’s downtown blocks. It was fun to see all the costumes! Thanks, Margaret. I hope you get to read A Time to Love. In the meantime, if you haven’t read book 1 in the series, you still have a little time to do so before book 2 releases :) A Time to Laugh is a fun read. seems like the older we get, the fast time seems to pass! what a great post. I love the covers on these books. this story really sounds interesting. Life throws us for loops all the time and we really need to rely on God land those who He has put in our lives. But that is difficult at times. Time does seem to fly. I look at my two kiddos and say wow, our son is now 32 and been married for two years and our daughter is now 30 and a woman in her own special right. Where did the time go? But it all is such a blessing. Thank you, Lori. Life certainly throws Melanie and Jordan quite a few loops in A Time to Love, but they do learn to trust God through them all. Yep, feels like yesterday my first son was born and next year he celebrates 31. But I do love seeing the men of integrity my sons have grown up to be, and so enjoy the role of grandmother that comes with their (or one of them’s) parenthood. I love what your church is doing. Time does fly.I find it hard to believe my grandchildren are getting so big. Thanks, Nancy. Every year for the past four or five years, our church as done one of Rick Warren’s Forty Days Of series. They’ve been really great. Thanks, Jessica. I’d always wanted to write a book set in Budapest as I found it such a beautiful city. This seemed to be the right story for the setting. Hope you get to travel there with my characters soon. Time does fly away! I didn’t realize it’s just 52 days for Christmas.. it seems so far away. I must agree with you, nothing romantic in having your knee operated! Can’t wait to have the box set released, and as time flies, it will be sooner than later. Love the new cover! And oh my, this story is going to wrench my heart. Thank you for the post. I love the excerpt of your book. Thanks for the opportunity to win the book. Thank you. I wish you all the best in the draw. Hope you get to read Snowflakes & Snuggles soon. Can’t wait to read the new stories!! Great ones coming your way soon, Lisa. another author to seek out reading material to read. Your excerpts were great to read.. especially seeing the covers of the books. Cannot wait to read your books. Marion, your premises are always so tantalizing. 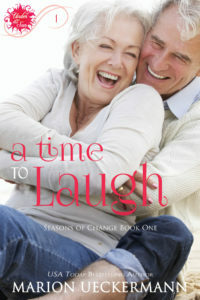 I love love love the cover of A Time to Laugh. I feel as if I know this couple!